Diamonds Aren't Forever: Close-Up on Sidney Lumet's "The Anderson Tapes"
Q: I'm lost. Who was surveilling whom? Q: What is 'The Anderson Tapes' about? A top-notch cast under superb direction and slickly made by Sidney Lumet who makes this movie enjoyable in every aspect . Amusing caper with magnificent acting by all-star-cast , acceptable production design and masterfully realized by the always original and great Sidney Lumet . After Duke Anderson (Sean Connery , being the first film in which he stopped wearing a toupee) is released from prison after ten years for taking the rap for a scion of a Mafia family , he cashes in a debt of honor with the mob chief (Alan King who also worked in ¨Just Tell Me What You Want¨ by Lumet) to bankroll a caper . Upon visiting his old girlfriend , Ingrid (Dyan Cannon married to Gary Grant) at her upscale apartment in New York City , he plans to rob the entire building . As the ex-convict , under strange electronic surveillance that have tracked him since he abandoned prison , wishes to pull off a big robbing . Agreeable as well as interesting picture with tight editing , magnificent acting , fast-paced , thrills , plot twists , emotion and entertainment . It was originally conceived as a tense as well as thrilling flick about a spectacular hold-up . Though the most movie is set in a luxurious building it never lacks for taut , suspense , intrigue , inspired direction and a climax particularly thrilling . The tension behind closed doors is tense , charged and riveting . 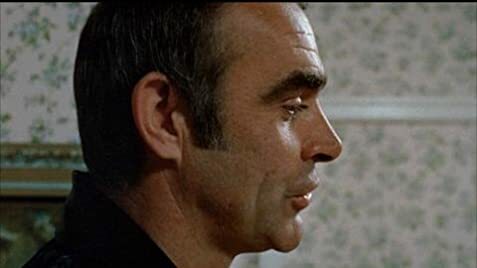 Sean Connery is very good as ex-inmate decided to carry out a big heist , being accompanied by a beauty Dyan Cannon . Support cast is pretty good , such as a young Christopher Walken -film debut- is perfectly cast as an ex-con , Alan King as mobster , Ralph Meeker as Police officer , Martin Balsam as gay man , Garrett Morris , Val Avery , and final feature film by Margaret Hamilton of Wizard of Oz , among others . Fine Quince Jones soundtrack . Atmospheric and appropriate cinematography by Arthur Ornitz . Frank Pierson's brilliant script was left virtually intact on this adaptation upon the novel titled "The Anderson Tapes" by Lawrence Sanders . This thriller was professionally directed by Sidney Lumet with an extraordinary plethora of actors who give awesome interpretations . It keeps the spectator utterly involved , it holds up extremely well on television . Sidney Lumet was a master of cinema , best known for his technical knowledge and his skill at getting first-rate performances from his actors and for shooting most of his films in his beloved New York . 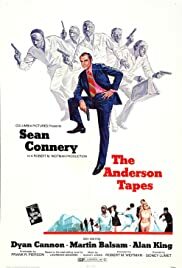 In ¨ The Anderson tapes¨ Lumet had a strong comeback with this box-office hit . He made over 40 movies , often complex and emotional , but seldom overly sentimental . He achieved great successes such as ¨Serpico¨, ¨The Veredict¨, ¨Fail safe¨ , ¨ Morning after¨, ¨The hill¨ , ¨Dog day afternoon¨, ¨Murder on the Orient Express¨ , ¨Network¨ and his best considered one : ¨12 angry men¨ . In 2005 , Sidney Lumet received a well-deserved honorary Academy Award for his outstanding contribution to filmmaking.